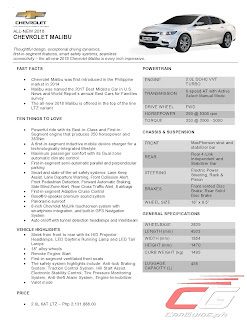 The Covenant Car Company, Inc., the exclusive distributor of Chevrolet in the Philippines brings in the all-new Malibu that is larger yet lighter than its predecessor, with greater efficiency and more advanced safety features than ever. First introduced in the country in 2014, the second-generation Malibu is built atop an entirely new architecture making it the most spacious sedan in its segment. 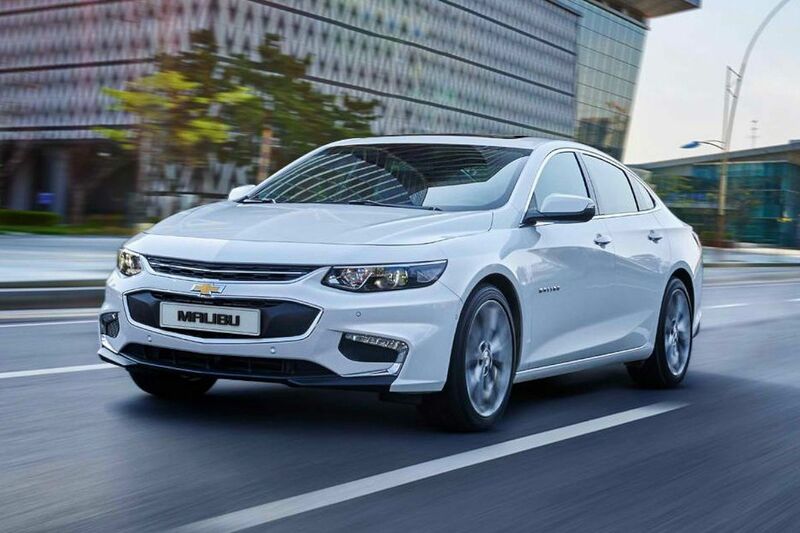 Yet, through the extensive application of high-strength steel and advanced weight reduction technologies, the all-new Malibu sheds 130 kg of weight. The Malibu introduced the essence of global Chevrolet design with its dramatic body proportions and coupe-like lines and this model is no different. Inside, the longer wheelbase allows a more open execution of Chevrolet’s signature dual-cockpit interior while improving knee clearance in the front and providing additional space in back. For 2018, the Malibu is powered by a first-in-segment turbocharged 2.0-liter 4-cylinder engine making 250-horsepower and 353 Nm of torque. It’s matched with a new 6-speed automatic that offers a wider gear spread and a closer ratio between gears making it more responsive than ever. The all-new Malibu features a MacPherson strut front suspension design that delivers a greater measure of control with rebound spring, and a proven four-link rear suspension design to offer segment-best ride and handling through individually tuned bushings on each link. It also comes with features such wireless charging, a panoramic sunroof, semi-automatic parallel and perpendicular parking assist, and a state-of-the-art safety system which includes lane keep assist, lane departure warning forward automatic braking, adaptive cruise control, and more. 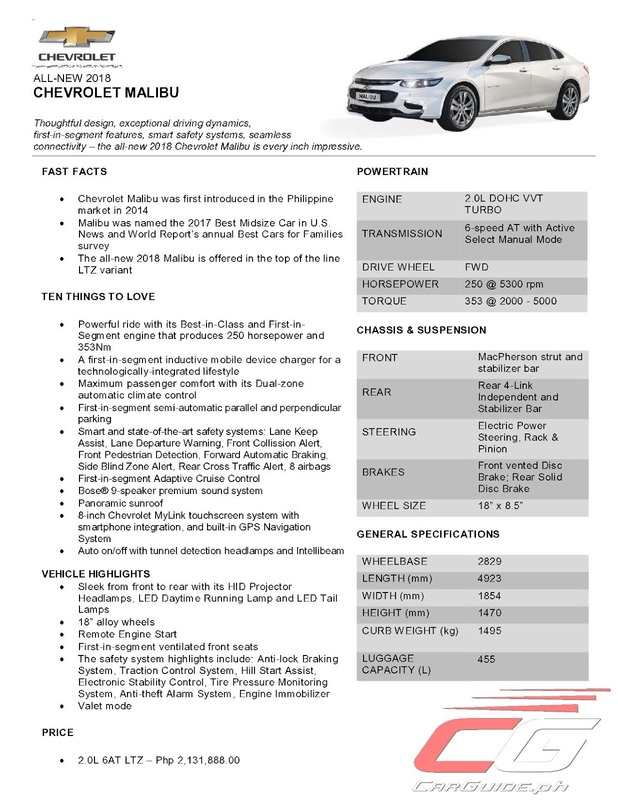 The 2018 Chevrolet Malibu is priced at P 2,131,888. Would be hard-pressed to beat the all-new Camry and Accord once they land here in the Philippines, but at that price, baka mas mura ito kaysa sa 2.0T na Accord (Though baka rin mas mahal sa V6 na Camry). Wow!.. didnt expect this from chevy but here they are. Dont EVER buy this if you already own a Subaru Levorg!